Thanks to everyone who made Dome Lab a rewarding experience. In response to Peter Morse on the first day, I jotted down a fewAi?? questions at the start of the lab about what I thought I wanted to get out of the lab. Here they are, together with a few subjective notes on what turned into a rather busy week. Welcome your thoughts. Is it worth developing content for dome projection? Absolutely. It’s early days but the scope for storytelling with immersive cinema is literally huge. This week we all got to experience content designed for our peripheral vision as much for our direct focus. While it may not be around the corner, I’m guessing that there is a market for this particularly with younger audiences less fussy about high quality projection.Ai?? Even in a town as dome-deprived as Sydney, fulldome content creation may be viable. The drive for ever-more immersive visuals is unlikely to go away. Once display technologies that already power the video walls on skyscrapers are suitable for wrapping up into a dome configuration I’m guessing we will see an explosion of artists in this space. What kind of stories work best in ‘dome space’? With its origins in astronomy and science shows, fulldome projection seems to lend itself to dreamy reflective visionscapes more than it does to taut drama. A number of the devices film-makers take for granted prove to be rather disconcerting to audiences, particularly close-ups. That said,Ai?? the lab suggests that its too early to limit the scope of dome content. Let’s chuck it all up there and see what people respond to. All four lab pieces have been tumbling around in my head since the weekend. Work referenced at the lab conveyed the sense that this is a new medium still finding its feet and reaching out to content creators. Keep an eye out for past and future work by Warik Lawrance and the Melbourne Planetarium content team, as well as by Hue Walker and Jonathan Strawn from ArtsLab (University of New Mexico). The combined experience producing original shows such as Tales of the Mayan Skies was invaluable. Hue’s discussion of dome as a day dreaming state is going to be worth rolling around some more. Peripheral vision is something else. What kind of compositions work best in ‘dome space’? We got to see a whole bunch of different compositions tested and presented in the space of a week. I particularly liked the use of wide shots where the action was happening well back in the frame. The team that filmed their Sam Shepard piece on what looked like terraces, fading actors in and out as they appeared closer and closer, was quite effective. It took some time to realise how much coverage you get from a fisheye lens and how the image reads on a large screen. I was certainly caught out a number of times, retreating out of shot. I also came away with a better understanding of framing as a creative technique. For all the talk of ‘frameless’ cinema, shooting and compositing the damn thing means a lot more attention to framing the experience. 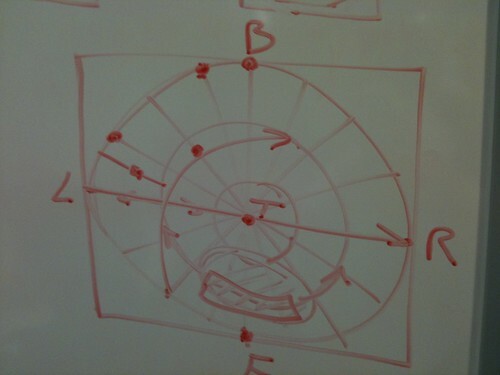 DomeLab host (and graphics pioneer) Paul Bourke gave an impromptu whiteboard explanation of how to read a dome (fisheye) image which I kept referring to for days. It’s all starting to make sense…. slowly. Warik Lawrance provided a useful tip for prospective dome projects. His team uses non-accurate (but somewhat more comprehensible) storyboards to pitch investors and stakeholders rather than actual dome maps. Sketching the fulldome experience in layman’s terms is clearly more important at the early stages than getting the perspective right. Keeping your head around the different composition remained a challenge all the way through production. Thanks to Ben Shedd who not only gave a number of insightful talks but practical tips on-set and in post (like the stickers in the photo below). What compositions might work for presenting up to seventeen characters? I didn’t get a chance to work on my existing Virtual Tour dome project at the lab (prompting this question) but thanks to the broad range of work displayed over the week I did note a number of compositions that could prove useful for arranging a large ensemble. Arranging people along the bottom frame line seemed to work reasonably well. As did presenting them in a slow moving carousel. Could the dome master become the definitive version of a project? One of the most practical new skills we learnt this week was the preparation of a Dome Master video (fisheye perspective) that can be delivered to planetariums. However it doesn’t look like this will be all that reusable in other contexts. In fact, it’s looking exceedingly difficult to see there being any definitive version going forward taking immersive cinema into account. One of the key realisations from the week was how variable ‘dome projection’ is. Given the variation in dome tilt angles and size there seemed to be even less opportunity for visual storytellers to lock down the user experience if they aspire for mass distribution of their work. Given that there were over a hundred versions of Avatar, I can only see more headaches to come for projects that do parallel dome deployment. Which isn’t to say it wouldn’t be worth it. But even the choice of shooting for iDome vs Inflatable Dome meant different creative decisions on-set. Is the inflatable dome viewing experience worth pursuing? I came to Dome Lab with a rather poor view of the inflatable dome experience. My take on it was that it is pretty much a gimmick and that once you have seen a number of screenings you would be unlikely to return for more. That said, having spoken to a number of inflatable dome operators, there definitely seemed to be a market for younger audiences in shopping malls and school halls. However, by the end of the week, perhaps due to the pace and intensity of the lab, I found myself growing more and more accepting of the inflatable dome’s limitations. Sure, the picture was nowhere near as sharp as other but I enjoyed chilling out in the intimate space of the CosmoDome. What kinds of domes are there? During the week we had the opportunity to compare a variety of fulldome environments. Horizon The Planetarium at SciTech provided by far the grandest experience. This is an18m, 194 seat, tilted dome , converted from an OmniMax theatre. 6 computers feed the image to 6 projectors to project a full 4k image over the dome. Videos are is sliced, to quote manager Carley Tillett “like cutting an apple pie into 6, producing one mpeg video stream for each of our 6 projectors”. This makes exhibition of real-time content generated from a single machine problematic. The tilt (around 33 degrees) of the dome is apparently quite extreme in comparison to other venues but it did create a rather satisfying immersive feel similar to IMAX. The CosmoDome inflatable system was kept inflated by a small pump and a velcro airlock, this system used a one projector/one computer and one mirror combination. While you could technically squeeze about thirty people into it, the practical limit was about 15. 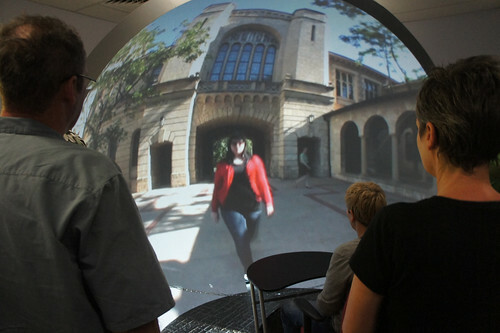 The iDome upright dome was familiar to me from working with the iCinema team at UNSW so I was more interested in impressions from other lab participants. No one I spoke to seemed to be all that motivated to produce content for this format but as a preview facility or single-user device it’s pretty handy to have one lying around. Given its size the iDome requires a far shorter throw for the projector than in other domes so it did produce a noticeably sharper image. I can see how iDomes can be useful for research and other contexts where single-use mode was the norm. But it’s hard to see this format being widely adopted. What is the future of fulldome venues? In comparing the fulldome venues we looked at, the first thing I realized was the value of having a fixed entrance way. Particularly for your casual, potentially inebriated, punter. I was curious to compare The Elumenati’s GeoDome with its vacuum sealed inner surface and the CosmoDome‘s simpler construction. Navigating a short airlock shouldn’t be a huge deal but it is clearly a headache for dome operators. It was funny watching the various mishaps as people entered and left. Leaning on the wall of an inflatable dome is a bad idea. I didn’t where to buy injectable flagyl flagyl. find the visible seam lines within any dome particularly distracting but I can imagine there will be an arms race to produce completely seamless surfaces for projecting onto perfectly smooth surfaces. We didn’t spend much time talking about non-inflatable mobile theatres but companies like Obscura Digital seem to be doing amazing work at the high end using portable geodesic domes. Would be good to get equivalent shows going around Australia. If anything, the key take-home lesson seemed to be that the quality of the dome surface and its construction is far less important than the audio/visual display technologies within it. The tinny small speaker system used in the inflatable domes all week let the experience down more than anything. Size does appear to matter as well. There seems to be no better place to view a fulldome show at present than a fixed dome planetarium with great AV systems but, as was alluded to throughout the week, it is difficult to see how the world’s planetarium venues can ever support an indie content sector any better than regular cinemas already do. The future may be augmented and virtual reality domes for the mainstream, and physical fulldomes for the privileged view. What kind of transitions work? If I learnt anything at the lab it was that speed on the biggest screens can be problematic. Some of the most effective work had long cross-dissolves and made a real effort to be kind to the viewer. As Ben Shedd pointed out, in a lecture reflecting his work shooting for the IMAX format, cuts that reposition the protagonist at a different part of the screen can easily leave the viewer staring at blank space. Learning to lead the eye is going to be fun. It’s going to be interesting to track how many of us lab rats will go on to produce dome work for distribution. I’ll try and compile some notes on the production pipeline from each of the lab teams. How we do all this dome business is perhaps just as vital as what we produce and why in the early stages of a new medium. There’s clearly a lot more that can be thrown at the screen. In this part 2, some comments about dome tilt. I do agree that for a “natural” viewing the dome tilt is pertinent. I certainly suggest that planetarium style domes are “weird” (= need special consideration) when it comes to producing filmed material. The iDome arrangement (at any size) is a more natural orientation, but as you say there are not many around. It is undoubtedy true that domes towards 90 degree tilt (iDome) need very different treatments than towards 0 degrees (planetariums). But I’m not too sure that whether a dome is 40,30,20 degrees would be a show stopper. From a technical perspective this is where the LadyBug style capture has the advantage, any tilt angle (within reason) can be achieved in post. In this first part of the comment I will address the dome size. I personally don’t believe that is an issue at all, in my experience we aclimatise very quickly and subconsciously compensate. I argue that this works in a dome where then there are no frames or references to the real scale world. I imagine this occurs because … if we are facing each other in real life (say 2m away) the angle your head, say, subtends at my eye is perhaps 10 degrees. In a small dome (eg: iDome) or a 20m dome your head still subtends 10 degrees (sure it is larger but further away so the angle stays the same). Further to the comment about (my suggestion) that dome dome is not important … it is equivalent to the fact that there is no such thing as a zoom in fisheye space. 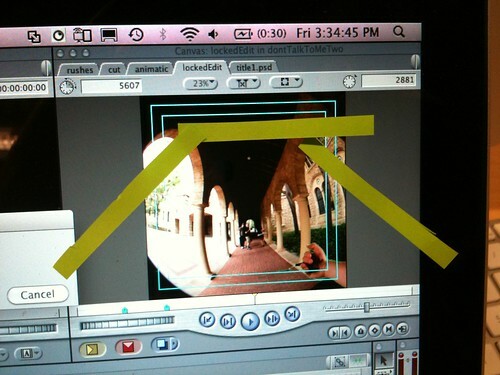 That is, one cannot bring objects closer to the camera (ie: larger) … except by moving the camera closer. Sorry, typing mistake in the previous message. Well as it happens stereoscopic content generation is more locked to screen size. Because stereoscopic viewing will always have the accommodation/convergence conflict, there is more of a science to creating easy to view stereo. For example, at infinity the parallax (horizontal offset between an image feature in the two frames) of an object at infinity should be the same as the eye separation, 6.5cm. Put another way, when we look at an object at infinity our eyes are parallel. So if one creates content for a 2m screen the objects at infinity should have 6.5cm parallax. But if that same content was moved to a 4m screen the parallax of an object at infinity would be 13cm. This means the viewers eyes would need to diverge! Not something we are used or design to do. Paul, thanks for your comments. Assuming that the variation in dome theatres can be dealt with, I guess the next question is how to master a work for both dome and traditional screening simultaneously? ‘Porting’ content from one style screen to the other was the basis of my Avatar observation. Are there any case studies where dome theatrical content was adapted from traditional cinematic work. There definitely are formula for creating precise and easy to view stereo. This is where many people make a mistake and think it’s an art rather than a science .. well geometry anyway. Fulldome CG producers of traditional science material do often create a wide screen version from the fulldome, assuming a sweet spot N degrees up from the spring line. This can obviously be done since one generated (captured) easily enough of the visual field of view. By I suggest that if one exploits the fulldome opportunities then creation of planar versions become less successful.